Jordan Peele certainly knows how to command your attention immediately. Us begins with some on-screen text about how there are thousands of miles of abandoned underground tunnels in the United States, then moves on to a TV commercial for the 1986 Hands Across America event. You have no idea what either has to do with anything, but you can't wait to find out. Peele is tantalizing the audience for the experience about to unfold. Anyone who thought it was a fluke that the comedian could make a great horror movie like Get Out will have their doubts dispelled by this magnificently original follow-up. Lupita Nyong'o and Winston Duke play Adelaide and Gabe Wilson. They head out to their summer home with children Zora (Shahadi Wright Joseph) and Jason (Evan Alex). While there, the family makes a short side trip to a Santa Cruz beach to meet up with friends Kitty and Josh Tyler (Elisabeth Moss and Tim Heidecker). It's the same beach where Adelaide had a traumatic incident occur as a child. Upon returning home that night, the Wilsons are terrorized by their doppelgangers. Their presence seems to have something to do with that beach. That's all you need to know right now, except that, yes, underground tunnels and Hands Across America eventually factor in. Much like Get Out, Us works on two levels – a fact that's incredibly apt in this particular instance. As a horror movie, it offers a lot of expertly-crafted chills. The doppelgangers are legitimately creepy. They look like the Wilsons, but behave much more brutally and mostly communicate in grunts. The exception is Red (Adelaide's mirror image), who communicates in a guttural voice that conveys deep menace. Whenever they show up, dressed in red and brandishing large pairs of scissors, the threat feels real. Peele keeps you guessing as to who they are and what they want, right up until the final minutes. That leads directly to the other level, which has more than a hint of social commentary. Us is very much about the duality of the United States (Us, get it?). To specify how would reveal far too many details best left discovered for oneself. What can safely be said is that America has always had its divisions – racial, economic, political, and so on. Peele uses his tale to say something about that. His ultimate statement is provocative in the best possible way, ensuring that you think about the movie's ideas long after it's over. The last five minutes of Us are the most shocking. To be honest, when the story makes a real Twilight Zone-y twist, I initially felt disappointed because it didn't appear to add up. Too much stuff seemed unexplained or to be negated by other things that occurred previously. Then a funny thing happened. In pondering everything further, it became clear that the various elements actually do fit together, and quite nicely. Us is a rich film with many clues scattered along the way. You may need to see it a couple times to pick up all of them, but they're there. Once the details have had time to be digested, the bigger picture snaps into place in a fascinating manner. Every single one of the actors does first-rate work. Lupita Nyong'o is the standout, though. She plays two characters who are different sides of the same coin, giving each her own distinct personality. The actress is unexpectedly good as Red, creating a shiver-worthy character who may haunt your dreams. This is a hall-of-fame horror performance that stands alongside Mia Farrow in Rosemary's Baby, Toni Collette in Hereditary, and other game-changers. Us is stylish, scary, and substantive, with a powerhouse third act. 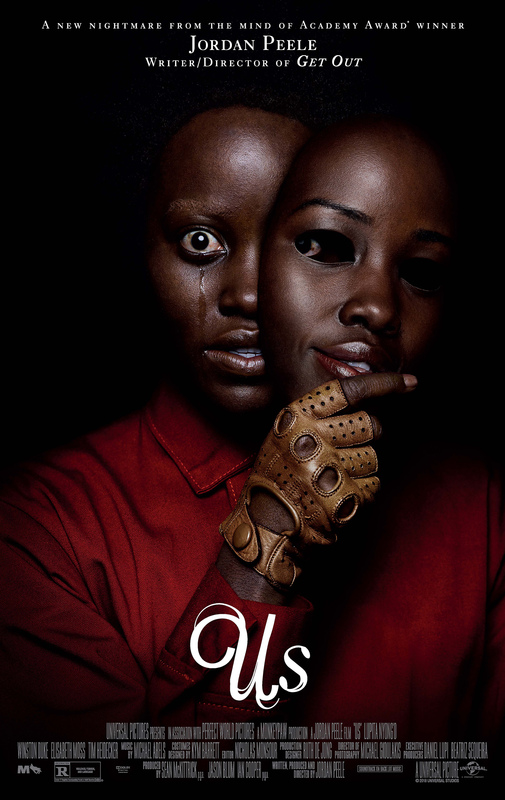 After just two films, Jordan Peele has established himself as perhaps the most vital horror director of the present era. Us is rated R for violence/terror, and language. The running time is 1 hour and 56 minutes.